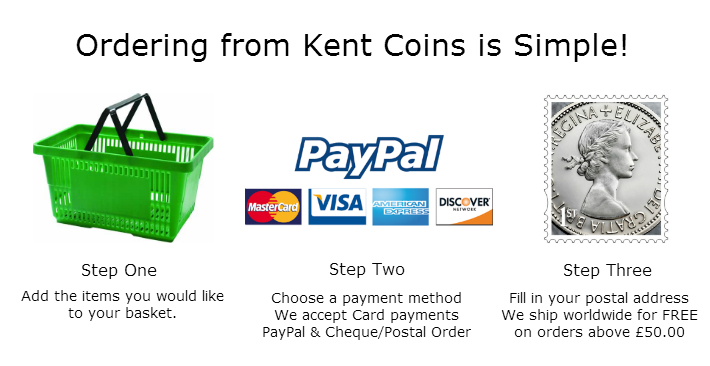 We accept PayPal, Cheque, Postal Order and Credit and Debit card payments. Payment can be made via credit and debit card through our integrated PayPal payment system; you do not need a PayPal account to use this service. If payment by Cheque is selected the items will be sent after payment has cleared so please allow extra time for this. Our stock items are unconditionally guaranteed as genuine unless stated to be reproductions or contemporary forgeries etc. The items shown in the pictures are always the one you will receive after you have made your payment. In the unlikely event that you encounter a problem with any item bought from us we offer a 28 day money back guarantee providing the item is in "as sent" condition, please email or telephone if you do encounter any problems. Under the EU's cookie laws many online shops and other websites have become technically illegal, this is due to those websites using cookies (small packets of information) to track customer information, we would like to reassure all our visitors that this website uses only cookies deemed as "essential" by that law, namely cookies to keep track of your order at checkout, we never store your payment details or any other information about our customers online through cookies or any other means, again if you have any questions on the new law please contact me before making a purchase. We try to be accurate in the grading of our stock however if you feel we have made a mistake please email or telephone and let us know, nobody is perfect and mistakes sometimes happen, we will always endeavour to rectify any errors of grading or description as quickly as possible. Most of our hammered and ancient coins have been found by metal detector enthusiasts and therefore may have been in the ground for hundreds of years, due to this some may not be completely flat, others may have corrosion/dirt on them and we will always try to mention in the description any faults or flaws with our items. 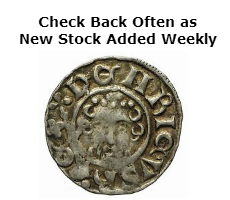 Take some time to study the pictures given before making a purchase as we use high resolution scans or photographs of each item for sale to help show you their condition, unlike many other coin dealers we often have lower grade items for sale and these may have been through the wars quite literally! I aim to send all items within 2-3 working days from placement of you order, if you need delivery on a specific date please contact me before placing the order. Items for sale on this website are sorted and packed by hand and so all orders are subject to checks before being sent, occasionally items may have been sold but still showing as available and in this case a full refund will be provided on any unavailable lot. All UK mail will be sent by 1st Class Recorded or Special Delivery and International mail by Standard post or International Tracked & Signed where requested, if you would like extra insurance please contact me before placing an order. Please select the correct option from the postage options drop list at the checkout, choosing an incorrect option will delay the shipping of your order. We reserve the right to refuse sale to certain countries or individuals as we see fit, this is rarely ever the case and we would always email you beforehand to resolve any problem. Any item may be withdrawn from sale from this website without notice as items are often offered for sale at other venues. If you have any other questions or enquiries please contact me through our “Contact Us” page. If you have any other questions regarding how to use the website our enquiries regarding our current stock please email me.